The unprovoked war of aggression against Syria was started and prosecuted by the key members of the Anglo-American Axis (AAA) for a variety of geopolitical and economic reasons. None of these quite obvious reasons are in any way mutually exclusive; in fact, they mutually reinforce each other. Like the other revolutions spawned by the CIA’s fabricated Arab Spring, the war in Syria was designed to over throw a democratically elected government in order to replace it with a U.S. installed puppet. The Syria piece of the puzzle is merely one more critical component of the Greater Israel project. Watching Israel fight for more territory in the Golan Heights in real time stands as testimony to this never-ending agenda. Of course, the Greater Israel project, upon completion, will permit the Western powers to completely control the Mideast geopolitical chessboard. 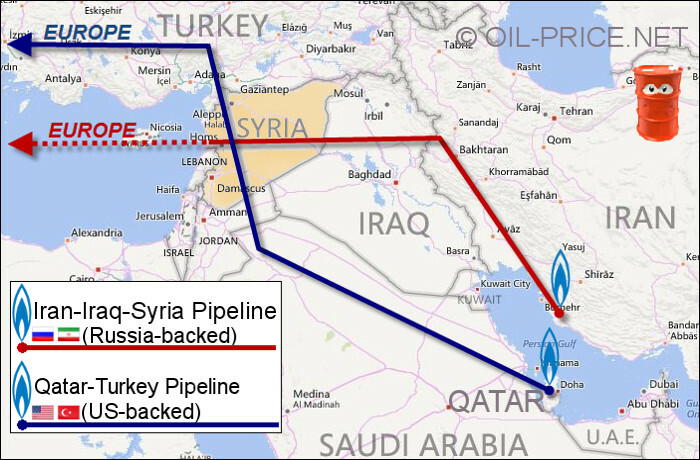 Secondly, the Syrian War is about oil and gas. Whoever control Syria controls a large strategic chuck of the Middle East and especially oil and gas reserves that have yet to be developed as well as crucial conduits. The various pipeline plans weigh heavy in this particular regard. As always the Russian-Iranian alliance plan competes with the Saudi Arabian-Qatar plan (See diagram above). This was a major determinant in the instigation of the Syrian War. Thirdly, there is the ever-present discord between the Shias and the Sunnis. Syria is yet another location where the religious conflict between Iran (Shia) and Saudi Arabia (Sunni) broke out into the open … and Israel inflamed the tensions since they believe they always benefit from the internecine strife. Syria had previously been a place if relative peace, especially given the prevailing state of affairs throughout the Mideast. There are other aims that the AAA has in Syria that are beyond the scope of this short note; however, they are also quite important to the success of their naked warmongering. The following links discuss the extra-regional goals to varying degrees. Each of those goal discussed are central to the prosecution of the Syrian War as should not be relegated in any way to those aforementioned purposes . N.B The following article has only been posted so as to show the error of so many geopolitical analysts on the Internet today. Many simply do not have a clue even when they write for some of the best platforms on the alternative news and commentary side of the net. That claim has no credibility for a very simple reason: there was no Qatari proposal for Syria to reject in 2009. It was not until October 2009 that Qatar and Turkey evenagreed to form a working group to develop such a gas pipeline project. Even more important, the immediate problem for Qatar’s proposal was not Syria but Saudi Arabia, whose territory the Qatari gas would have to cross to get to Syria. In January 2010, The National, a daily UAE [United Arab Emirates] newspaper reported that the main obstacle to the idea of a pipeline to carry Qatari natural gas to Turkey and then to Europe “was likely to be Saudi Arabia, which has a track record of obstructing regional pipeline development” and still had very bad relations with Qatar. And Middle East geopolitical analyst Felix Imonti reported at Oilprice.com in 2012that Qatar had been forced to abandon the pipeline idea in 2010 because Saudi Arabia had not agreed to have it built across its territory.